First I confessed that I am no Martha Stewart of homeschooling. 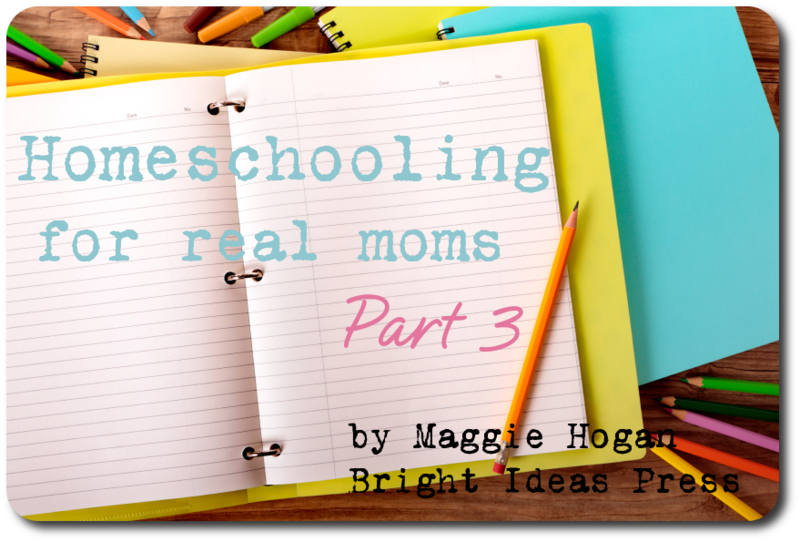 Then in my last post I shared 5 tips to help organizationally challenged moms homeschool successfully. Here are 5 more. Remember, these are suggestions, not commandments! Occasionally surprise your kids by mixing things up. Would they get a kick out of a accomplishing schoolwork in an odd place for a day? Pile pillows in the bathtub (empty, of course) and they can work in the tub. Go undercover by draping a blanket over a table and doing school underneath with pillows, blankets, and flashlights. My favorite: turn the master bedroom into the classroom. Take everything you might need (including the popcorn!) onto the bed and pretend to be on a boat surrounded by sharks. A pathway of socks can become tiny islands to step on for getting to the bathroom. The days when I cook a few extra meals to put in the freezer are a blessing. I often double up on any given meal so that I can have one for a busy day or a sick friend. I almost never cook a single chicken! I prefer to brown 5 or 10 pounds of ground beef at a time (perhaps with onions) and freeze what I don’t immediately need. The extra can be pulled out for a head start on chili, tacos, spaghetti, etc. Crock-Pots are a mom’s best friend. Good pizza coupons are treasured. And the husband who offers to bring home the occasional Chinese or deli meal is worth his weight in gold! Although I love co-ops and was involved in them from my first year of homeschooling until my last, they aren’t feasible for everyone. But if you have a friend who is teaching the same course as you and would be willing to share the work load in planning lessons or gathering resources, what a blessing! Bonus–checking in with each other to see how it’s going adds accountability. History/science projects and field trips are great ways to keep learning in the summer. We even had a couple of short summer school sessions with appealing material that the kids were eager to dive into. Count the hours toward the following year’s (not previous year’s) school. This provides less pressure during your more formal school time and you “start” the new school year with something already accomplished! Remember–every homeschool family will have its own approach to learning and scheduling. Experiment with these tips to find what works best for you. Homeschooling is not a race, it’s a journey. There isn’t an award for doing the most, the fastest, or having the prettiest portfolio. There IS an award for training your children with a mind to God, their future, and their personalities and abilities. Breathe deeply. Pray. Enjoy the journey! Maggie is Bright Ideas Press's Founder and Creative Director. She is a wife, mom, grandmom, author, and speaker. Her favorite things are Jesus, playing with her granddaughters, reading, writing, traveling, encouraging moms, and drinking coffee. Find Maggie on Twitter @MaggieSHogan or on Google +. I love the post. I sometimes forget to keep things fresh and fun. I also have an 8 month old baby, so this was really speaking to me. I’ve been homeschooling for 3 years. I also was homeschooled myself but even with all this experience, I still need reminders that I’m mom first and foremost. We are not a school and we need to do what works best for our family. I love this series Maggie! You are such an inspiration! Thanks for your kind words, Christine. I’m always glad when my messes (and the way God has and is growing me) are inspirational! I hear so much wisdom in these words, Maggie. I love that you’re a “real” mom and not a “Martha Stewart” one. We don’t even need that kind of pressure to perform to some artificial standard. Martha has an entire corporation to plan, organize, and fulfill her ideas. We normally have just ourselves! I totally agree about the journey. I’ve stopped worrying about how much we accomplish and simply take pleasure in the forward motion. As long as we are not going backwards, I’m content.